Some were "Sooners" who took off before the noon starting gun - hence the state's nickname, The Sooner State. A few years later, a huge oil boom made instant millionaires of many of these original settlers. Today, Oklahoma is rich in top attractions for summer touring including the great outdoors that await at Lake Texoma on the Texas border, along with Lake Murray State Park in Ardmore known as Oklahoma's "vacation central" with sandy beaches and an endless supply of prime Oklahoma campgrounds. More exotic fare is also on view at the wildly popular Oklahoma City Zoo and Botanical Gardens featuring a kid-friendly butterfly garden as well as a children's zoo. At peak season, the state capital also draws visitors to two top amusement parks, Frontier City, and White Water Bay. Zoo (middle); and the Frontier City amusement park in Oklahoma City (right). Year round, Oklahoma City also manages to pack 'em in at Science Museum Oklahoma (with interactive exhibits for kids of all ages) as well as at the National Cowboy & Western Heritage Museum where American history comes alive in art and artifacts of the Old West. Last but not least, Oklahoma is also one of the top states offering visitors major tourist attractions related to its proud American Indian heritage. These include the restored Cherokee village at the Cherokee Heritage Center in Tahlequah; the Gilcrease Museum in Tulsa; and the planned American Indian Cultural Center in Oklahoma City. 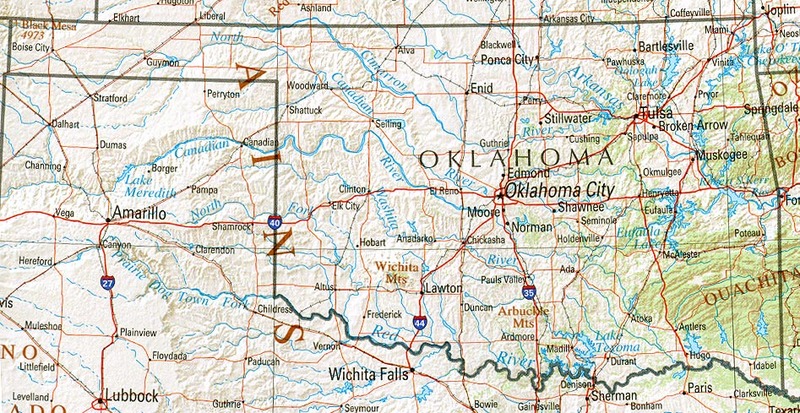 TravelOK.com : Official Oklahoma Tourism Info - The official OK travel site with lots to do and see including picture galleries, video clips, hotel & restaurant guides, major Oklahoma tourist attractions, guides to golf courses, resorts & state parks. Oklahoma Attractions, Events, Travel, Tourism and Recreation - Guide to central Oklahoma with the focus on American Indian and western heritage with facts & information on major attractions, dining & lodging, kid-friendly and family fun, calendar of events, related links. Oklahoma City Convention & Visitors Bureau - Fun, colorful site to the capital city with video clips & photos along with practical information on where to stay, what to see and do, guides to cowboy and Indian cultural sites & events, horse shows & rodeos.